‘Tis the season of resolutions and big plans for the New Year. In 2015 I wrote, “Dear 2015, I want it all” and in 2016 I shared my resolution replacement, the word of the year. So, like last year I did a little word-clouding. That’s a new verb. Try it. Last year’s word cloud was pretty telling of what 2016 would bring, as I was chewing on the possibility of reentering the business world, in no small manner, and what that would mean to me. I did, and also spent considerable time following Marcus, our household rockstar, around the country. It’s been like having two full time jobs, with “like” being a grand understatement. 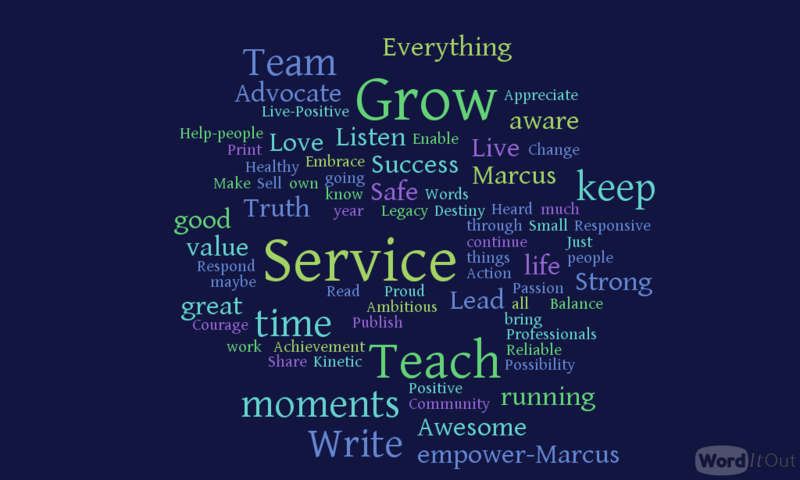 2016 brought its share of awesome partnerships, great team building, fabulous Marcus moments, and a few not-so-pleasant surprises and complications. A few of these un-pleasantries have followed me into 2017. So, ok. But guess what? I’m not sorry. I want to help people. I want to teach and advocate and give great service and help businesses grow and employ good people and empower success and I’m going to keep trying to do all of that. Take that 2017! So, here’s the word cloud of my thoughts and hopes for 2017. Last year’s word “Purpose” jumped out to me from the cloud. Ironically, this year’s word/phrase didn’t even make the wordart. In fact, it may sound like the opposite of most of the words there. Like the word “balance” came up, but only as a contrast to “kinetic.” Kinetic is more applicable to what this year has in store. Action. Motion. Energy. So why, then, is this year’s word, well, phrase really, “I am patiently fulfilling my destiny” – ? Sometimes, when there is all this action, it’s easy for me to get lost in the moments. The stressful moments. The What’s Next moments. The I’m not done with that thing that needs to get done, moments. And then, when the thing is done, when the moment has passed, I quite literally forget I accomplished anything. I keep charging forward, in more than one direction, and when the done things fall off the list – I forget they were even there. You get more done than most people I know. And I know some achievers. Your book has a 100% 5-star rating on amazon. You know, I kind of forgot that. This is why I keep Quinn alive. And why I have to remind myself to be patient. Being patient doesn’t mean waiting, it means acknowledging when everything that can be done has been done and accepting that sometimes the next move is out of your control. Also, I don’t actually know my destiny, but I have hopes and ideas of what I want it to be, and I am working….working…working towards a complete me that requires all that work and also, uh oh, patience. Also, when it comes to writing and sharing, I ask for patience from you, dear reader, this year. I have some important words brewing and some important things to say, and I am going to test that patience word with finding the most effective placements and try to discern the best sharing balance. I hope that you, my most loyal readers, will keep coming around and following me around now and then. I resolve to join him in trying to remind you of how much you DO actually DO in 2017! I would be lost without you and so you have complete claim to 1/2 (or more) of anything I get done. You are awesome and appreciated my friend! I only hope to be able to keep up with you in the coming year!